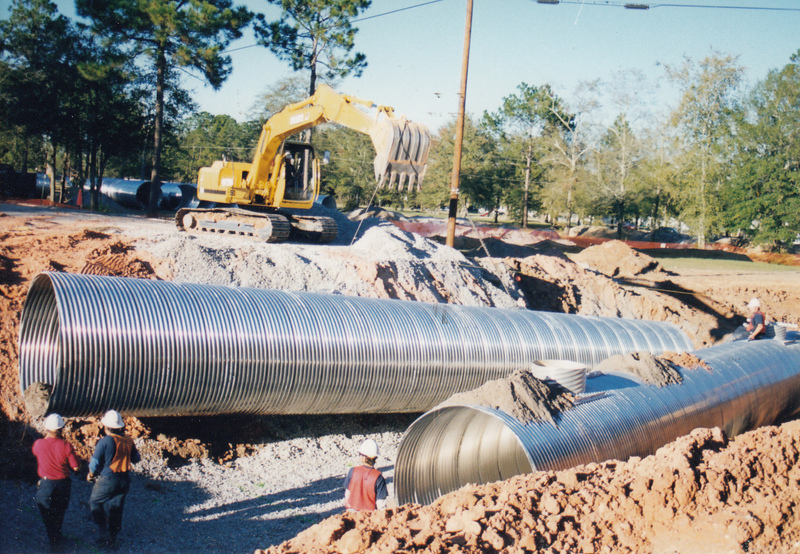 50′ sections of 84″ corrugated aluminum pipe were utilized in this critical cross drain application. Prefabricated curb inlets can be seen on the installed section. Over fifty years of successful installations have established solid corrugated aluminum pipe as having performance capabilities in excess of one hundred years. Fabricated from a special clad culvert sheet, this hardened aluminum alloy can be used in pH levels as low as 4 and resistivities as low as 500 ohm/cm. Where clean, granular backfill is used, aluminum pipe performs exceptionally well in salt water conditions. Because of the formation of aluminum oxide, which is always present on the surface of the pipe, aluminum culvert is highly resistant to abrasion. Because there is no base steel to expose, aluminum pipe offers this protection for the full thickness of the culvert wall. In addition, aluminum weighs approximately 1/3 that of steel and 1/35 that of equivalent sized concrete pipe, meaning longer sections can be handled with standard excavation equipment. This can reduce the number of joints and installation time. By utilizing its own combination of metal gauge versus corrugation profile, aluminum pipe delivers the necessary structural integrity to handle today’s installation techniques. Aluminum is an ideal material for culvert application, underground detention/retention, farm pond structures, and storm drainage in aggressive environments. Availability includes diameters 12″ to 120″ in metal gauges 16 to 8, including pipe arch dimensions. Please click here for additional information on solid aluminum pipe.